This engaging new series of leveled biographies brings history to life one dramatic story at a time. By focusing on poignant moments as well as public triumphs, Amazing Americans makes paragons of American history feel accessible and real. 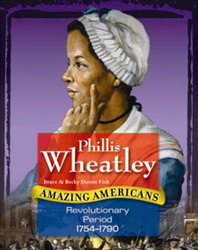 When she was about seven years old, Phillis Wheatley's life changed forever. She was kidnapped from her family, forced to march to the African coast, and put in a slave ship. Weeks later, Phillis arrived in Boston, where she was sold as a slave. What neither Phillis nor her new master could have known was that what she did with her life from that point on would be used for years as an argument against slavery. Learn how America's first African American woman poet survived a childhood in slavery to become a symbol of freedom.